Persistence in pursuing one’s dreams is a quality that is essential in running a business. 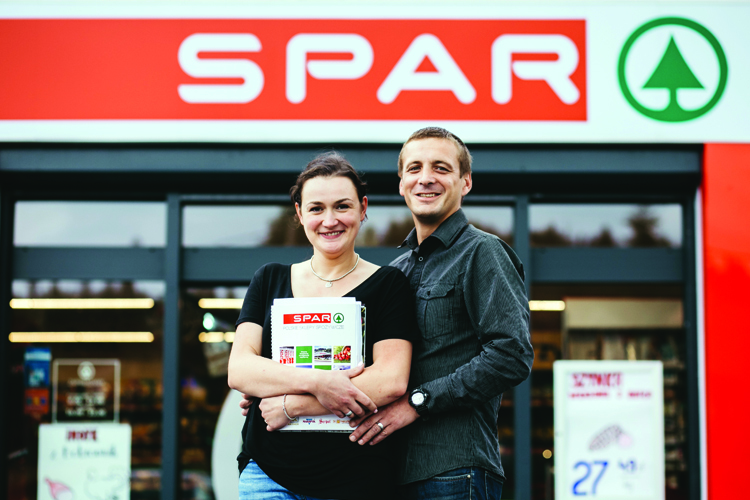 The story of Magdalena and Jacek Ślusarczyk from Poland, who opened their first SPAR store after working abroad in Ireland to save money and gain retail experience, perfectly illustrates how drive and perseverance can result in a story of success. The time spent in Ireland provided Magdalena and Jacek with invaluable insight into retail trends in the west and gave them all the inspiration they needed to make the right investment decisions once returning home to Poland. Not keen to take too many risks, Magdalena and Jacek were eager to make the best use of the money they had saved whilst working abroad: “We spent eight years in the south of Ireland,” said Magdalena. “We left Poland with a very particular goal in mind, to earn enough money to come back home and start our own business – specifically a grocery store. As soon as Magdalena and Jacek returned to Poland, they began looking for a strong and reliable organisation with which to partner. “Comparing the offers of many retail companies, we came to the conclusion that SPAR was the perfect fit for us, providing the most transparent business dealings and most attractive product offerings and prices. “We were already familiar with the SPAR Brand from our time in Ireland, where we used to do a lot of our shopping at SPAR Supermarkets. We were always impressed by the great product ranges, attractive instore designs and the excellent customer service. Magdalena and Jacek’s neighbourhood SPAR store in Dabrowa Szlachecka was opened in March this year. The hero categories and products are sourced from local suppliers and producers and include: the fruit & veg department, the meat & cold-cuts counter, and the bakery section. The offer is appreciated by customers and is in line with SPAR Poland’s strategy of supporting local businesses and producers. In terms of future plans, the possibility of opening more SPAR stores is certainly an option. First however, the couple have their hearts set on starting up a catering company that will also help supply their SPAR store. Asked what else they brought with them from their time in Ireland, they both said the belief and drive to succeed: “As far as we’re concerned, it’s really worth pursuing your dreams. We are very lucky to say that the reality of how things turned out even exceeded our expectations,” said Jacek.